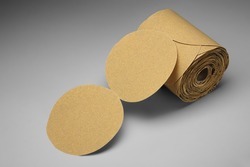 An aluminum oxide Stikit™ disc roll constructed on an A-weight light paper backing. Open coat construction features an anti-load coating. The open coat feature provides a more aggressive cut than a comparable closed coat abrasive of the same grade and a special loading resistant coating makes this disc a good choice when loading is a problem. Slightly more aggressive than 214U.